Everyone wants to give their dog the best chance in life. The author's border terrier, Lily, was a fussy eater as a puppy, plagued by earache and skin problems. As dog lover Henrietta Morrison began cooking for her, Lily's problems disappeared. 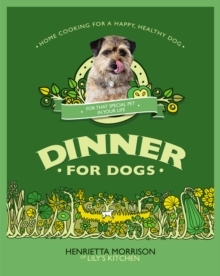 A passionate believer that we should feed our dogs the same quality of food as ourselves, Henrietta serves up in this attractive book of 50 tasty and easy recipes for dog food, developed with the help of a vet. Here are ideas for making your own biscuits, kibble and quick treats perfect for long walks, as well as nourishing everyday recipes including recovery recipes for poorly dogs and dishes perfect for young puppies. Alongside the recipes come tips and advice - from how to read a pet food label to the best herbs to include in a homemade meal for your dog. This charming book is a delicious treat for dog lovers everywhere.